Digital HID (DHID) offers the most cost-effective, value added alternative to fluorescent, induction and LED based lighting technologies for new and retrofit industrial and commercial Green lighting projects. With significantly increased electrical efficiency and lighting output performance over traditional core and coil (magnetic) ballasts, DHID is truly the common sense evolution of High-Intensity Discharge lighting. 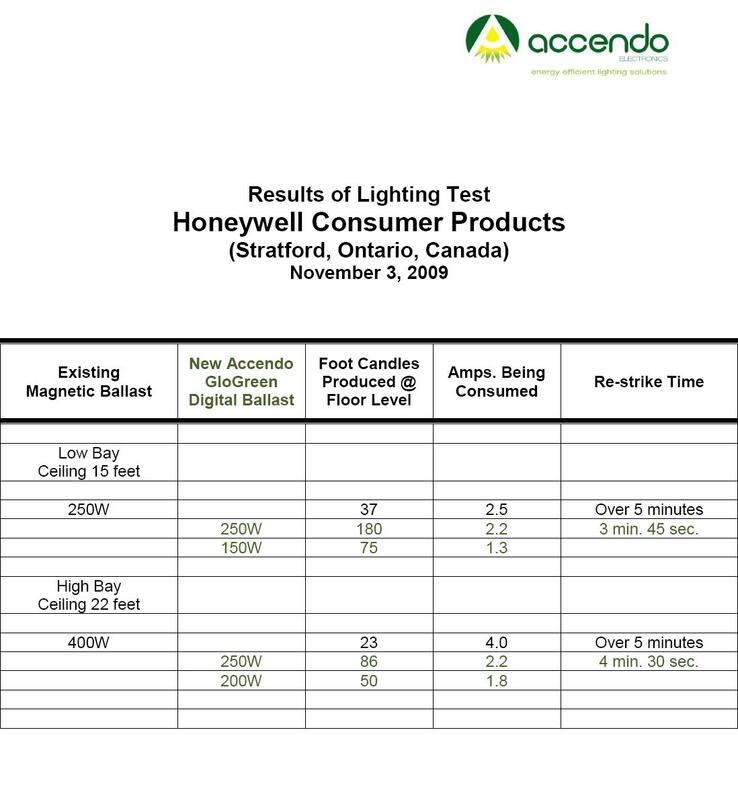 The following are the results of high-bay and low-bay ceiling factory/warehouse facility lighting tests where existing core and coil (magnetic) ballast powered Metal Halide bulb systems were compared to the new Digital HID (DHID) ballast powered Metal Halide bulb system. 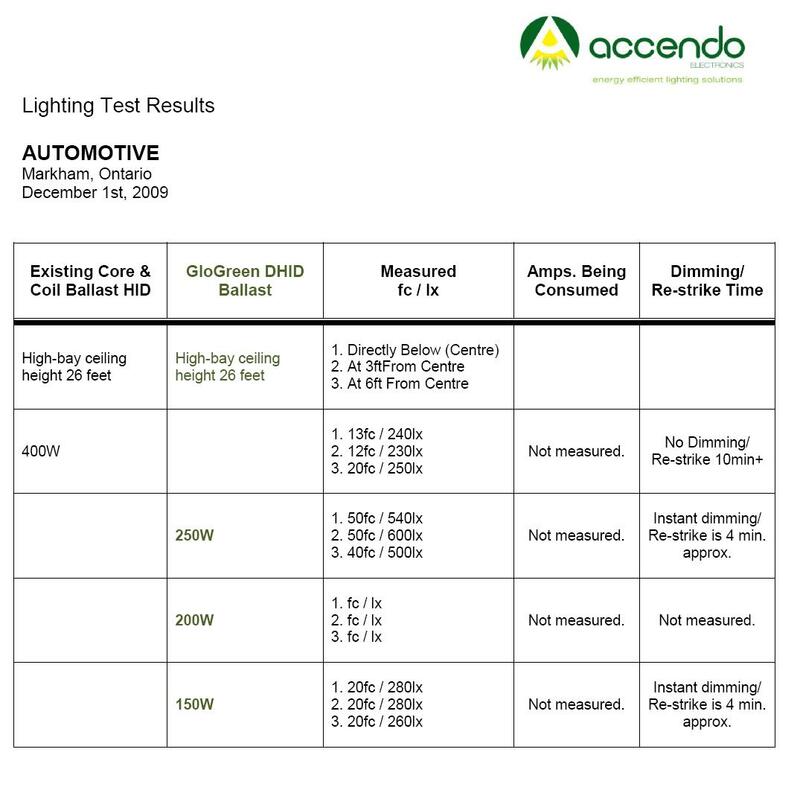 Accendo GloGreen DHID ballasts are available in 50W to 1000W configurations, solutions to upgrade any existing/old 70W to 2000W magnetic HID ballast based systems. Automotive facility lighting applications include the upgrade/retrofit of existing core and coil (magnetic) ballast powered highbay, parking lot and building perimeter lighting fixtures. This recent report compares the existing magnetic 400W versus the new GloGreen Retrofit DHID 200/250W ballast with a 250W MH bulb. The GloGreen Series operates either MH or HPS bulbs to meet all facility requirements indoors and outdoors. Please refer to the DHID Retrofit and New Installation Guide for details of the recommended retrofit and installation methods. The GloGreen DHID ballast does not degrade more than 5% over the entire lifecycle of the bulb, so originally specified light levels remain constant throughout this time period. 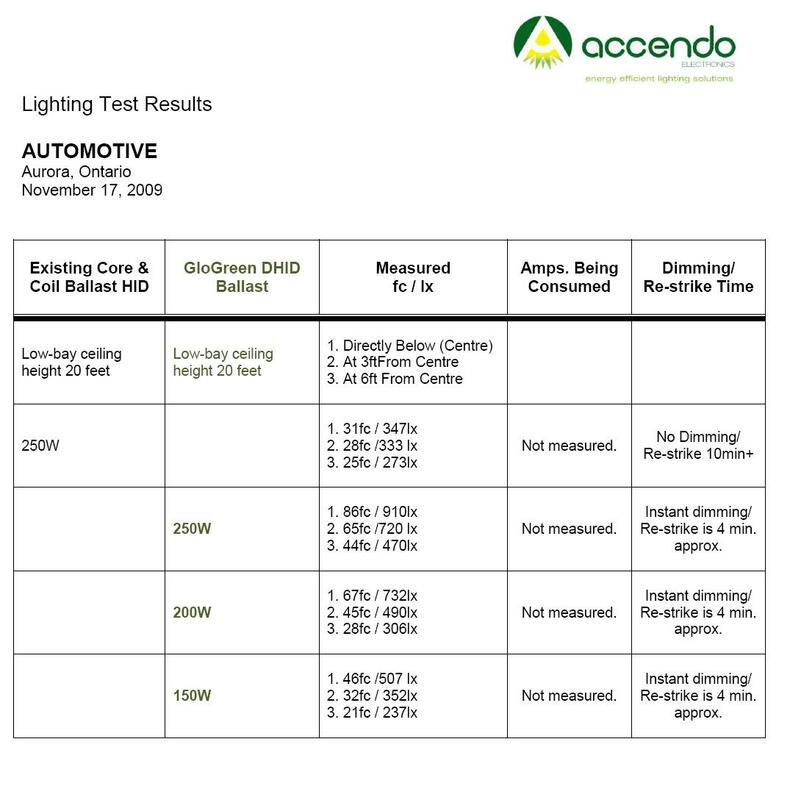 In the “…Lighting Test Report Ontario Automotive Feb 2010…pdf” example below, the antiquated magnetic system with 400W bulb may originally output 8,200 lux with a new bulb, but in the first 6 months of operation and beyond, the magnetic ballast powered bulb will suffer degradation and the fixture will require relamping sooner to return to the original lighting specification (the used bulb in this application is only outputting 4,320 lux). The GloGreen DHID ballast operating a 250W bulb will originally output 7,400 lux at a fraction of the electricity consumed. From the original 7,400 lux the DHID powered bulb will never visibly degrade, ensuring the project lumen output requirement remains constant always. 95% lumen maintenance makes relamping unnecessary and guarantees brighter longer lasting light ensuring the shortest and most realistic return on lighting investment time with minimal maintenance/ consumable costs incurred over the long term. Objective: Direct comparison of performance between existing 250W magnetic ballast powered cobrahead street light fixture and GloGreen 250W and 150W DHID ballasts retrofitted in the same existing fixture. We welcome the opportunity to discuss our findings with you further. Digital HID ballast lighting solutions offer the best value and performance for Industry’s most realistic short and long term return on investment savings. DHID lighting offers a better return on investment over LED, fluorescent and induction in initial buying cost, performance, light-quality over time, and in reduced maintenance and bulb consumable costs. 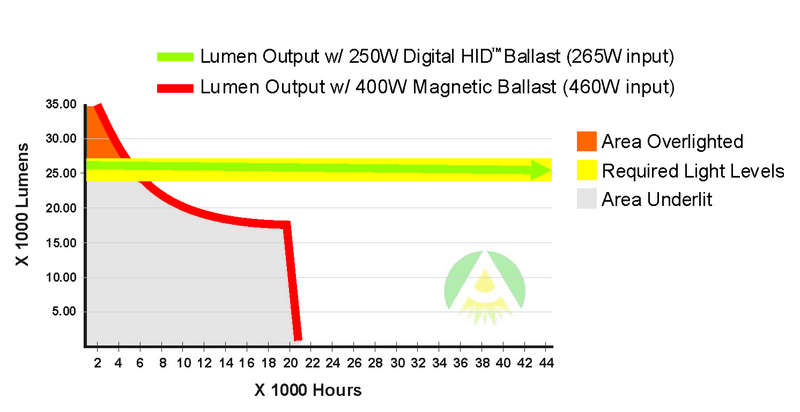 DHID powered bulbs last 30,000 hours to 40,000hrs and beyond without degrading more than 5% over this entire life cycle; please see 95% Lumen Maintenance = No Relamping! for additional information.